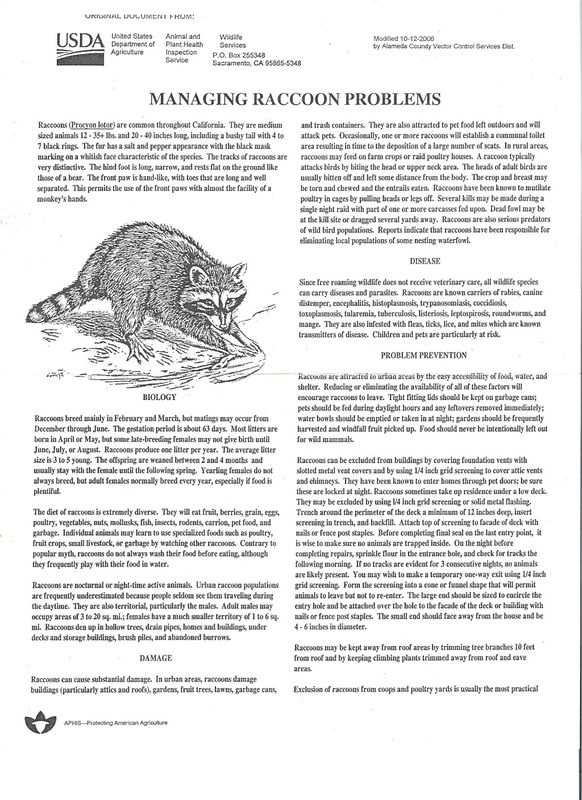 Crown Harbor has had a new round of raccoon problems. When it is breeding time, the females look for dens. One female occupied an area under a small roof at 1327 and 1329 Crown Drive. She used the nearby tree to climb on to the flat roof. She clawed her way into the adjacent enclosed space, made a den, and had a litter of 4 to 5 babies. They have since been forced to leave, and the hole has been covered. Vector Control will not trap unless there are unusual circumstances. 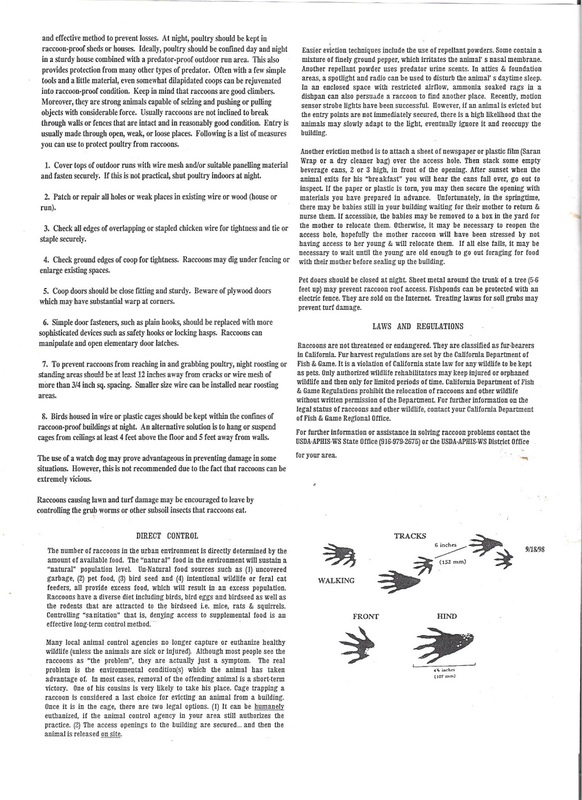 According to their handout, "Trapping should only be done under extreme circumstances." They have the problem that they cannot relocate them per Department of Fish and Game rules. 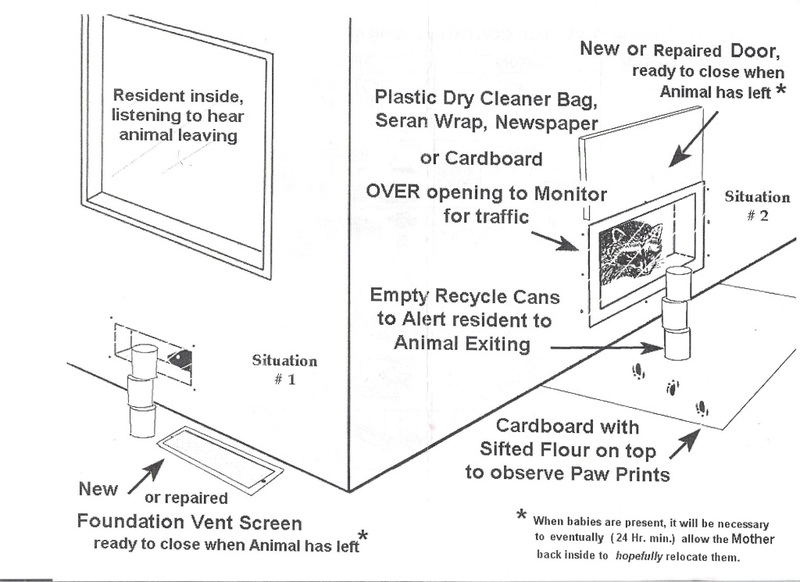 This leaves euthanasia of trapped raccoons as the only option for which Vector Control does not have the budget. Experience shows that removed raccoons are only replaced by new animals that then claim the previous animal's territory. We could legally trap them and euthanize them at our expense. A major problem is the availability of food. Unfortunately there is a good food supply for them within Crown Harbor. They will eat almost anything. We have a reasonable population of squirrels, rats, and mice which they consider prey. They routinely find and consume uneaten pet food. They love any seed-based bird feeders. Our problem persists even though the complex has done a very good job of limiting their food supply. An issue we cannot control is the large dumpsters at Crown Beach Regional Park. These dumpsters receive waste food from recreational park users and often are not properly closed. There are also fairly large open dumpsters at Ballena Apartments. We contacted the park and the apartment complex to make them aware of the situation and sought their help. Check your property for signs of raccoons trying to gain entrance. Look for scratch marks on the down spouts or siding. Look for the start of holes being made in the siding or near vents. 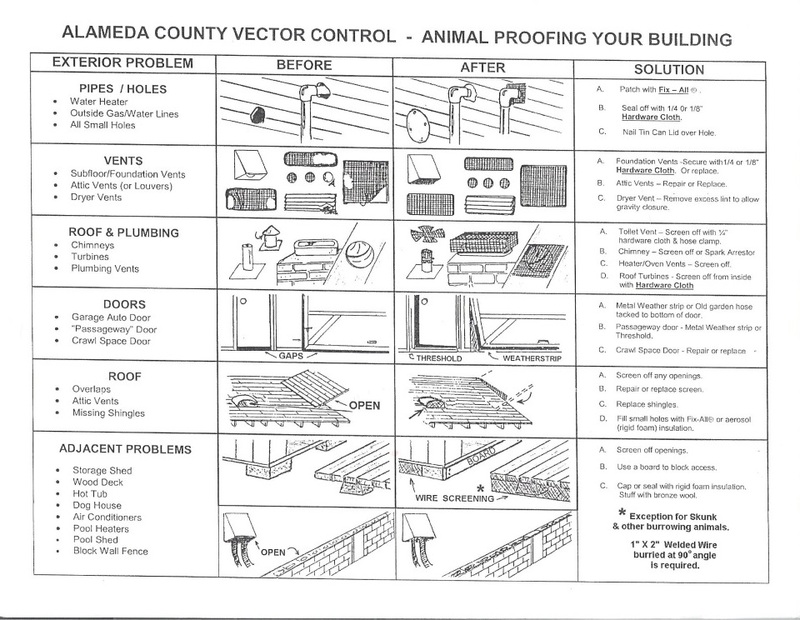 If you think you have a problem, contact Associa Northern California or Vector Control Services. If you see raccoons: make loud noises, shine lights on them, or spray them with a hose using a nozzle. Consider using special repellents. These are available and have a relatively low toxicity. Make sure all sources of pet food are not available at night. Raccoons are nocturnal. These are only available online — not in the stores. Residents have had moderate success with them. When they operate properly, they are effective. The problem is that defective ones make an audible and annoying whistling sound. Under normal operation, these units are not audible to the human ear. Dog walkers have the option to carry Bear Spray. It will only slow down a charging grizzly bear, but it will definitely stop any racoon attack. It can be purchased at REI for about $40. It is much more powerful than mace. Here is something the Association has done. Raccoons use the sewer system for travel as well as nesting. 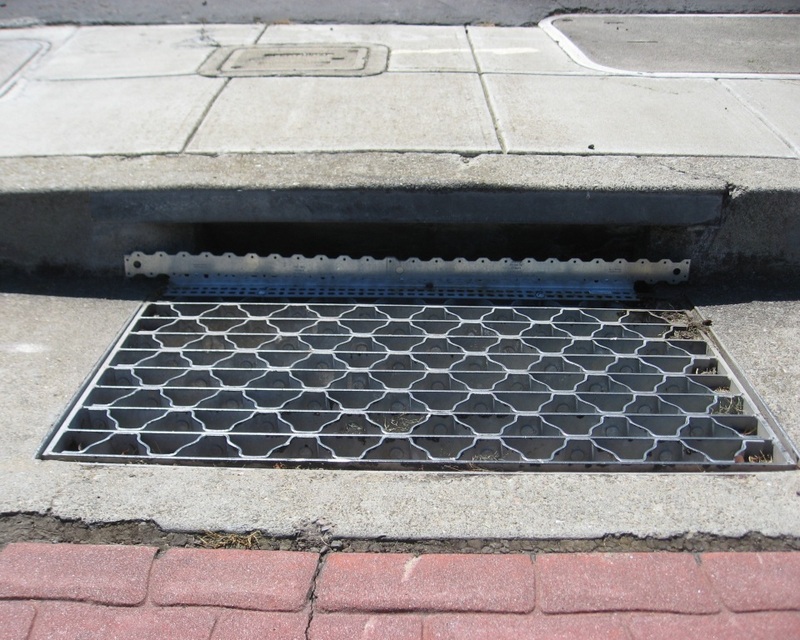 The Association has installed metal guards to prevent raccoons for entering the server system via the drains in the Association. Thanks to Board member, Sean McDermott for the design and installation of this deterrent. Here are some resources you can consult for information.